Hey, everyone! So many awesome new stories for me to read on the thread! Here's my next Flash Fiction story. Like all of my others, I'm keeping STRICTLY to 500 words and my goal is to tell stories that connect to others in the book (and series), but can also serve as stand-alone tales. 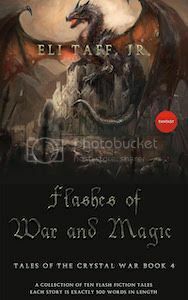 These will all be going in my upcoming anthology: Flashes of War and Magic. Osmer was an old man when the demonic hosts of the Dread Lord Vargo Duuk invaded the great city-state of Stormhaven. He wore his finest white ceremonial robes and prayed at the altar. With a great cacophony, the large oak doors suddenly flew off their hinges and crashed onto the polished stone floor. A red demon fifteen feet high with a terrible fanged maw and bulging muscles stepped into the Great Cathedral, its large black talons clicking on the stone floor. “I fear no demon.” Osmer said, facing the unholy creature as it feared to its full height. The demon snorted, bared its teeth, then turned and walked back out to the slaughterhouse of the city. A figure in purple velvet robes entered through the ruined doorway. “Do you fear me, Osmer?” She pulled the hood back, revealing a stunningly beautiful woman with raven-black hair. “Katarina?” Osmer’s voice was a whisper. Katarina’s face shifted and reformed itself into the harsh, bearded face of a man that vaguely resembled Osmer. Torphin ran in holding the fabled Sunblade in both hands. He ran toward Osmer with a feverish look in his eyes. Specks of red spattered his white beard and robes. Torphin pulled the Sunblade from the High Priest’s body. His mother smiled, pulling the purple hood back over her head. Re: 500 Words - Dark Fantasy Flash Fiction - "A Test of Faith"
Here's my next Flash Fiction story. Like all of my others, I'm keeping STRICTLY to 500 words and my goal is to tell stories that connect to others in the book (and series), but can also serve as stand-alone tales. Hope you enjoy them! The exhausted troopers braced their feet in the dew-covered grass. They lowered their spears and propped them along the tops of their shields. In the distance, savage hordes of Orcs thundered across the Jade Grasslands in a roaring tidal wave. Overhead, Elven Dragon Knights clashed with the winged Dreadbeasts of Drakkoro. At Todrik’s side, Gwendolyn Greenbriar pointed her ivory staff toward the charging Orcs. “They have cavalry.” She said. Large armored Orc berserkers perched atop frothing war boars pumped full of hallucinogenic mushrooms barreled ahead of the footsloggers. The war boars squealed as they charged, churning the meadows to mud as they carried their blood-crazed riders forward. The Orcs crashed into Todrik‘s line of soldiers, and the battle devolved into a bloody melee. Todrik’s son, Alric, was a heavy-set young man, tall and broad-shouldered from years of labor in the fields. He listened from the doorway. Across from Gwendolyn, Todrik’s wife Jesemine sat and glared at the wizard with cold eyes. Gwendolyn placed a long, wrapped pack onto the table. “Alric. Commander Willamont often spoke of you. He wanted you to have this.” She waved her hand over the top of the bundle and the hemp rope came apart. Flaps of wrapping fell away, revealing a long-sword sheathed in an intricately decorated scabbard. The pommel was sculpted to resemble a roaring dragon. The silver cross-guard held glittering emeralds that twinkled in the candlelight. Alric Willamont picked up the sword. The blade hissed and rang as he pulled it free from the scabbard. Jesemine pointed to the door. “What happened?” Todrik slurred as consciousness returned. Todrik nodded, retrieving Brightstar from where it had fallen.